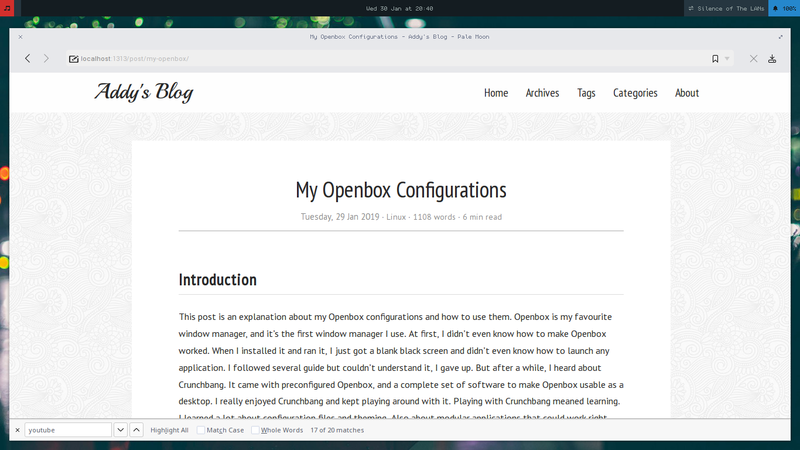 This post is an explanation about my Openbox configurations and how to use them. 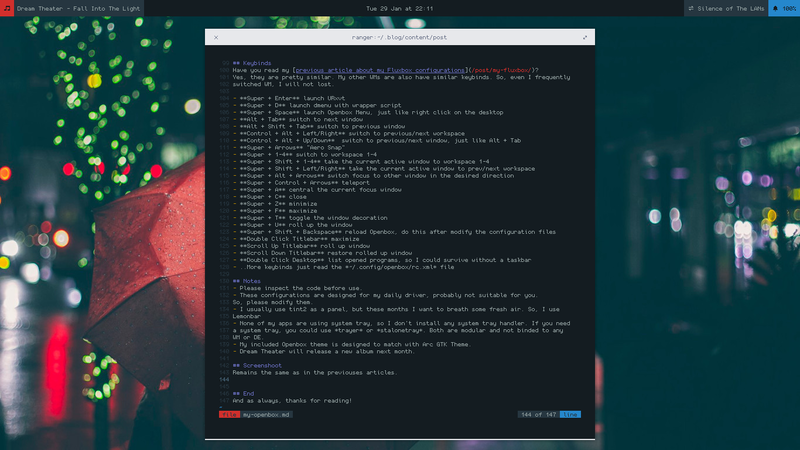 Openbox is my favourite window manager, and it’s the first window manager I use. At first, I didn’t even know how to make Openbox worked. When I installed it and ran it, I just got a blank black screen and didn’t even know how to launch any application. I followed several guide but couldn’t understand it, I gave up. But after a while, I heard about Crunchbang. It came with preconfigured Openbox, and a complete set of software to make Openbox usable as a desktop. I really enjoyed Crunchbang and kept playing around with it. Playing with Crunchbang meaned learning. I learned a lot about configuration files and theming. Also about modular applications that could work right with Openbox. I also tried a lot other popular window managers, but still couldn’t leave Openbox. After I thought I had understood enough, I tried to build a clean Openbox setup with Arch, and then Void. But they were pretty fragile, I dealed with a lot of breaks there. So, now I use Debian. But I still keep my Void setup, sometimes I want to try a new version of software that Debian doesn’t provide. I don’t want to use Debian Testing or Sid, it will defeat my purpose of using Debian. Despite of distrohopping a lot, my Openbox setup mostly remains the same with Crunchbang or BunsenLabs formula. By the way, I install Debian from the minimal CD with everything unchecked on the tasksel. Then I only install packages I need, the result even more minimal than Arch with similar setup due to Debian package splitting. For example, instead of installing full Libre Office Suite, I can cherrypick Libre Office Writer & Libre Office Calc only. But I still don’t have a time to write a documentation about my full Debian setup, might be next time. In this article, I will only explain about Openbox and Openbox related packages. Hsetroot is a wallpaper handler. Openbox has no wallpaper handler by default. Suckless Tools are several utility made by suckless.org, but actually I only need dmenu. Unfortunately the package is not splitted, so I need to pull them all. Scrot is a simple screenshot taking app. Full explanation in this article. Lemonbar is a bar or panel, and I use Conky to generate statusline for Lemonbar. Full explanation in this article. Then, get my Openbox configurations from this archive. Extract it to your home directory. So, you will get the .config and other directories in your home. I use URxvt as default terminal. If you’re interested, check this article. I use Dunst as notification daemon. If you’re interested, check this article. I use ncmpcpp as music player. If you’re interested, check this article. I use Fish as interactive shell. If you’re interested, check this article. It’s the folder where Openbox configurations are stored, there is several files inside. rc.xml is the main Openbox configuration file. It stores what items displayed in the titlebar, how many workspace we have, what font is used in the titlebar, keybinds, mousebinds, window behavior, and many others. I put three files in the archive. They are just wrapper scripts. launch is a wrapper script to launch dmenu with custom arguments. pulsevol is a script I stole from Vera’s dotfiles to make me easier to control the pulseaudio volume. screeny is a wrapper script for taking screenshot using scrot then open the result instantly using the default image viewer. Logout then login again with Openbox session in your login manager. And welcome to Openbox. Have you read my previous article about my Fluxbox configurations? Yes, they are pretty similar. My other WMs are also have similar keybinds. So, even I frequently switched WM, I will not lost. Please inspect the code before use. These configurations are designed for my daily driver, probably not suitable for you. So, please modify them. I usually use tint2 as a panel, but these months I want to breath some fresh air. So, I use Lemonbar. None of my apps are using system tray, so I don’t install any system tray handler. If you need a system tray, you could use trayer or stalonetray. Both are modular and not binded to any WM or DE. 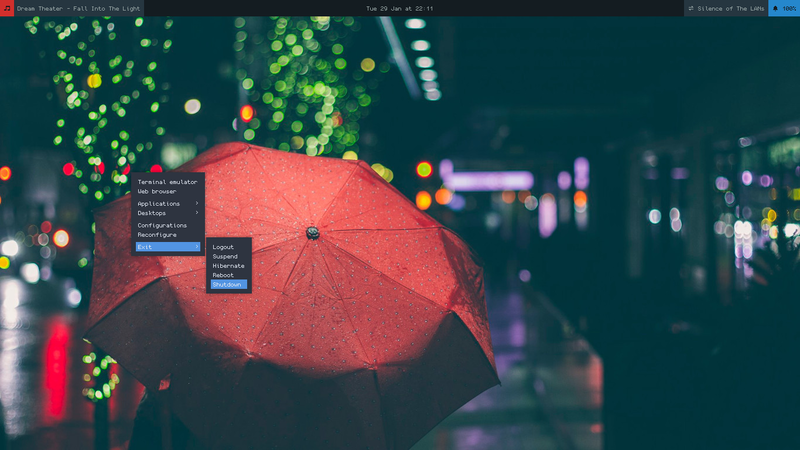 My included Openbox theme is designed to match with Arc GTK Theme. Dream Theater will release a new album next month. I use systemd, so the command to shutdown, reboot, and hibernate in Openbox Menu involves systemctl command. On non-systemd system, the command will be different. Remains the same as in the previouses articles. I can’t speak English well, so I write a caption. Please enable it.